Hail to the chiefs, starting with the Algonquians then George Washington who awarded Capt. Bullitt 300 acres in Hot Springs, Virginia after the French and Indian War. The Homestead opened on this land in 1776 and has hosted 23 presidents since. Happy Birthday cake is served daily to celebrate 250 years! At 10 am in the lobby, join the magical History Tour for lots of trivia and stories. Before hand you might meet Wilson in the Main Dining Room, warmly welcoming guests to the heartiest of breakfast buffets for only 60 years. He says he doesn’t usually tell people that but they might notice him on the 55 plus wall commemorating employees who have served for that amount of time. Service throughout the Homestead is tried and true, deploying southern hospitality by 1000 employees, 80 who have worked there for over 30 years. Stately, nostalgic, historic and charming are mere words to describe two of the most iconic golf courses in America. These picturesque Homestead courses snuggle against the Allegheny Mountains. The Old Course, a favorite of many past presidents, is a journey of elevated fairways and evergreen valleys. Clouds and fog hug the mountain range with illuminating sunshine between that highlights the resort’s magnificent architecture and style. From many points on the course the massive tower of the Homestead is seen jutting into the Virginia sky, signaling this is the place to be. Expansive is not a long enough word to describe the lodge, grounds and resort offerings. Even the woodchucks on course are longer than normal. The Cascades is rated the number one course in Virginia. A stone monument at the start highlights Sam Snead who says, “If you can play the Cascades, you can play anywhere.” The difficulty lies in blind tee shots over severely sloping fairways leading to fast greens along babbling brooks and mountain streams. Lower level cascades naturally fall throughout if not suffering a drought. If waterfalls meet your fancy, sign up for the optional 3-hour tour of Cascades Gorges in the afternoon but don’t try to go on your own; as it is guarded private property and trespassers will be fined. The concierge could direct you however to a public viewing spot of 84-foot waterfalls. 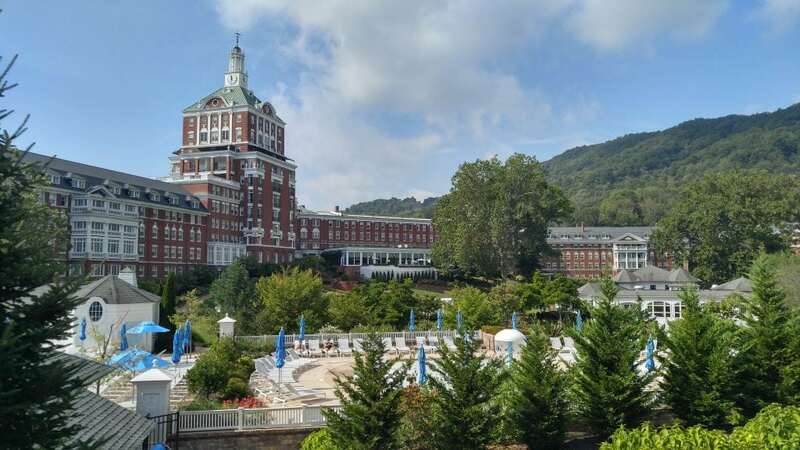 The Allegheny Springs delivers a water fix for the whole family complete with swimming pool, whirlpool, lazy river, water slides, and even a sandy beach and food service. In winter it converts to a skating party. In separate buildings for men and women, the Jefferson Pools provide soaking opportunities in the naturally heated Hot Springs water. Adults only, might make a day of the Spa Garden where registered guests and members are admitted on a daily limited basis to enjoy this outdoor healing Hot Springs pool, the cold shoulder plunge shower or the River Reflexology Walk. Tiny stones are patterned to soothe the 15k nerves in your feet. Who knew there were that many? Sign up at the spa desk for this separately priced or packaged amenity. And/or enter the Aqua Thermal Spa inside to alternate between hot and cool therapies. Relax in radiant-heated loungers in front of a scenic waterfall on screen or in the Herbal Cocoon room’s heated niche below a starlit ceiling or in the Aromatic Steam room with essential oils and colored lights. Cooling after exposure to heat happens in The Chill, a cold cabin where you inhale the crisp vapor and apply flaked ice directly to your skin or the Experiential Showers, which mimic by choice an Artic Mist, Atlantic or Caribbean Storm. Relax, rinse and repeat at the Aqua Thermal Spa, complimentary with paid therapeutic services, which are plentiful to choose from and all very satisfying from facials to full massages. However you spa, make it a whole day and you will say, “Ah,” at the Omni. In the old days, Virginia taverns were abuzz about politics. Today Sam Snead Tavern still serves as that venue on the town corner, a short walk from the resort. The resort fire pit is another spot where debates might begin. Fireside smore’s kits are as calming as the flames and last more than a night. This is where you meet other guests like John, a retired doctor from Knoxville and his wife Beverly, mother of 3. Strangers compare notes on places they’ve been and what to do here, like hitching a hayride up to the ski slope for more smore’s there. The Casino connected with the pro shop and next to the fire pit is not a casino anymore but a casual place to dine. More exquisite cuisine is served on the patio high above the pit or inside at Jefferson’s Restaurant. Begin toasting with a White Water Hound or Virginia Manhattan. Local rack of lamb and spicy shrimp grits are prime entrees. The Main Dining Room for dinner in the evening requires jackets, a salute to the elegant days of yore. Shoppers might stroll downtown to a cute eccentric store but it is closed on Tues. and Thurs. Sparrow’s nest on property sells artisan gifts, jewelry, pottery, paintings, and homespun fabric art. The grand shopping hall has something for all within the resort leading to the Main Dining Room. Hike, bike or hop on a horse at the equestrian center. Play a board game in a cozy corner inside, golf or ski but no matter what you do, enjoy the wooded scenery, fresh air and hot springs – the town’s namesake as well as the well being, well healing reason for early settlers to visit. Today, the nostalgia might have you thinking in terms of thee and thou. You can’t believe it ‘till thine eyes hath seen it. Check schedules for seasonal activity hours at www.theomnihomestead.com.